Every nation and people group have formative stories that describe the lives and rise to influence of some of their most influential leaders. Some of our greatest leaders, such as George Washington and Abraham Lincoln, have as part of their narratives stories from their childhoods, such as chopping down a cherry tree or living in a log cabin. They are as much a part of their legacy as their individual achievements. There are some things that frustrate me. You know what I mean? Things just that just make me want to groan in agony. You want to know what frustrates me? That we spend so much of our time belittling someone, because they do not look like us or share our same opinions, or they go about things in a different way than we would like. That frustrates me. When I look at all the violence that exists in our world. When I think about the violence that exists in our streets. That frustrates me. When I think about the drug problem in our Commonwealth. When I think about the struggles families experience trying to make ends meet or get out of debt. When I think about how families spend so much time in the rat race of schedules. That frustrates me. A couple of days ago there was a photo that made its way around the Internet. In this particular photo was a picture of a turkey having an intense conversation with Santa Claus. 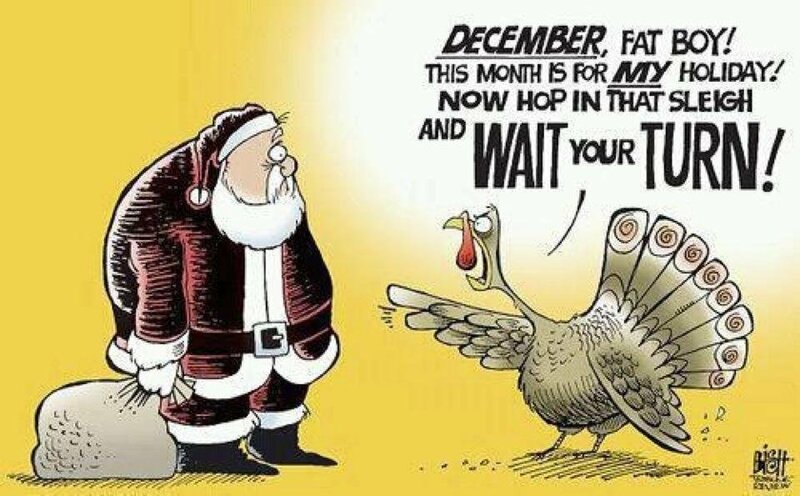 The turkey wanted to remind Santa that November was his month and that Santa would have to wait until December. This turkey was not interested anyone else grabbing the spotlight. This morning, I asked you all about what is it that you love about Claylick because it is important for us to claim what is special about this amazing church. I ask, as well, because I love hearing the stories about what makes Claylick special to each of you. It has been four months since Abbi, Noah, and I moved here. Every day since we arrived we have been amazed by what God has been doing. A lot has happened in these four months. We have all laughed. We have all cried. We have all been challenged. We have all pondered about what it means for us to be the church God desires us to be here in our communities. It has been a busy four months.